Well..... about time I write a blog post, eh? Life kinda got away from me the end of last year - serious operations for our dog and work stress and everything else just made this here bloggy thing a little less of a priority. But from prompting of my co-blogger, Daryl, I think it's time I get back in the swing of things. 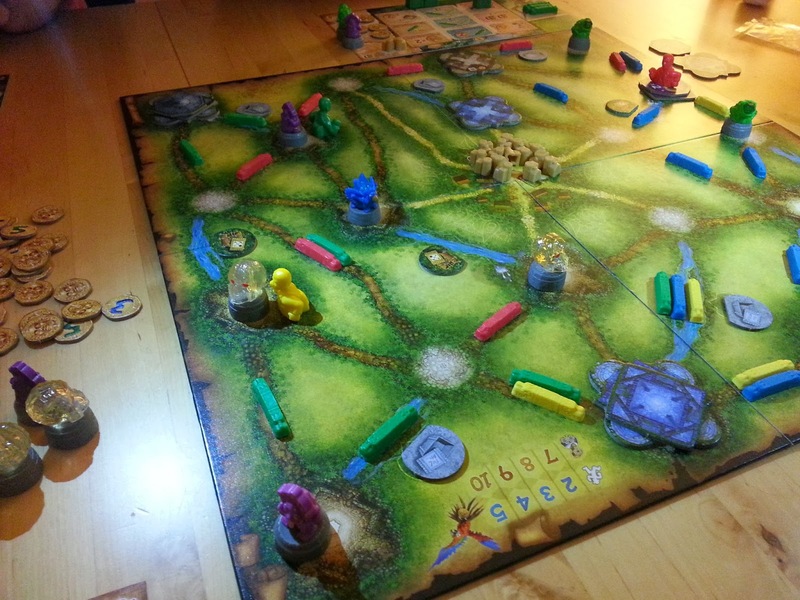 In the past few years, the board game industry and many designers seem to be re-hashing the same old mechanics in a lot of new games with some good and many mediocre results. 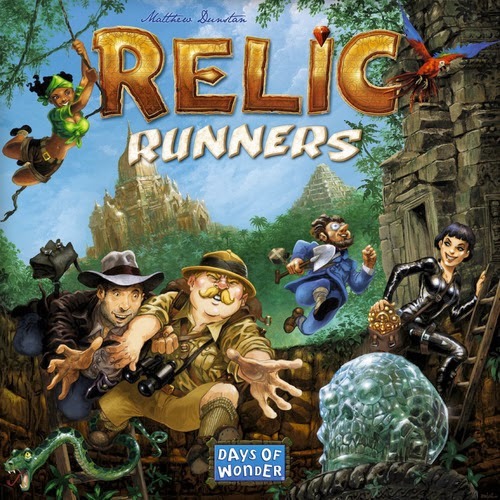 So when I played Relic Runners for the first time, it felt like a breath of very fresh air. Sure there's a technology track and endgame bonuses and networks to be built but how everything is implemented and fits together feels wholly original and very, very, very developed by Days of Wonder. But what makes the game so good to me is how simply and brilliantly it transforms from movement and exploration in the early and mid-game to a race for the relics in the end game that feels so wholly different but entirely appropriate. For such a simple family strategy game, nothing I've played this year has provided such a thematic and narrative arc to its gameplay. I could go on and on about the positives of RR (board and tile variation each game, hidden points till the end, long-term strategies, plays in under 60 minutes EVERY TIME!) but perhaps I should save it for a full and glowing review. This may not be my most played game this year but, in my opinion, it is the most well-developed and original strategy game I've seen in the past 12 months. It also happens to have the nicest damn pieces of any game I've seen in years, totally justifying the higher-than-usual price point. 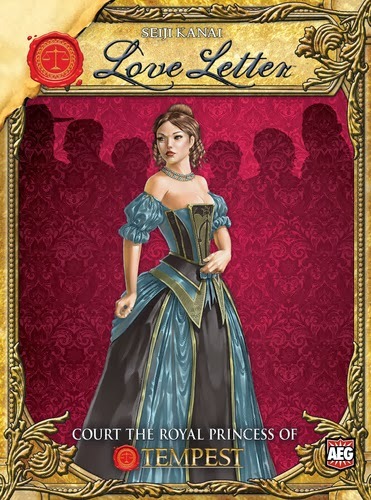 Anyone who has read this blog previously knows that I enjoy the simple rummy-style card play and hidden goals of Ticket To Ride and the pick-up-and-deliver systems in a game like Age of Steam. Cinque Terre simply and elegantly puts the two together in wonderfully colorful way. Collect fruit cards, trade in for fruits, deliver for points, complete contracts, rinse and repeat. 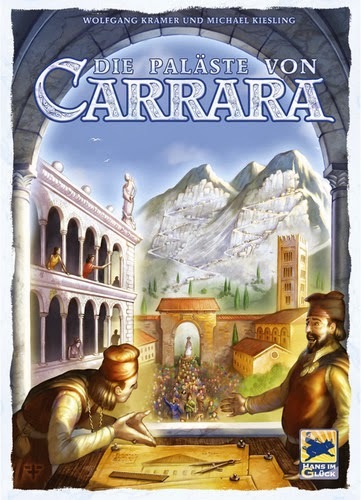 Although there are some quirks that should bug me about this game - action point AP in each turn, hidden contract rules slightly more complicated than they need to be, not too many strategies to explore - they all seem to be minor when balanced against the genuinely enjoyable and mildly puzzle-y gameplay. This has probably been the most played game for us all year because it's fairly easy-to-teach and, well, we all just kept wanting to play it again and again. Also, as a bonus, its scales really well from 2-5. If you enjoy Ticket To Ride as much as I do, this game will be a hit with you. It was clear to me after the lovely Asara in 2012 that Kramer and Kiesling are kind of an unstoppable duo (Kramer's been going for decades!) Much like Asara, the mechanics in this Euro have all been done before but it still feels totally fresh. Resources are bought, resources become buildings, and buildings score points. Pretty standard stuff. However, allowing people to decide when and what they score, the clever market mechanism, and the variety of endgame cards in the full game (the only way to play) elevate this game to greatness. And while playing, the game is constantly giving you that same feeling that you get when you find that great deal at Ikea. "Start the car. START THE CAR!!!" This challenging and ingenious worker-placement game may have been a 2012 release but I didn't get my copy till 2013 so I'm counting it. If you haven't seen the clever timing mechanism the gears create, check out my post here for a look. This a tough game to play well that I am utterly terrible at. But I'll always play it and I'll screw up the timing every time. The expansion arrived 2 weeks ago at our place which should add a few, er, "wrenches in the gears" of a game that was already tricky enough. Can't wait to try it. 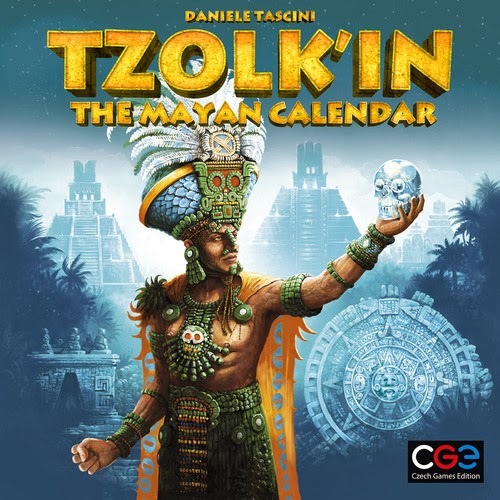 I was too eager to wait for the English edition to come out and asked a good friend pick this Spiel des Jahres-recommended title up for me while he was in Germany. It's a simple, relaxing game that was just perfect for the cottage this past holiday. You collect colored tiles and place them in sequence on numbered spaces to score points. 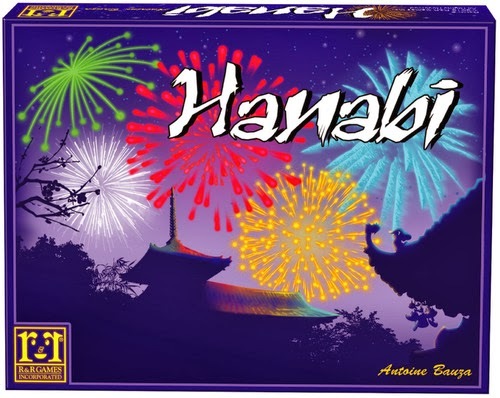 There are a few decisions, mainly whether to play right away or wait and draw more tiles in the hopes of a higher score, but nothing is ever too strenuous. It's lighter than Qwirkle and kind of a perfect game to play in front of the fireplace with some Bailey's in hand. 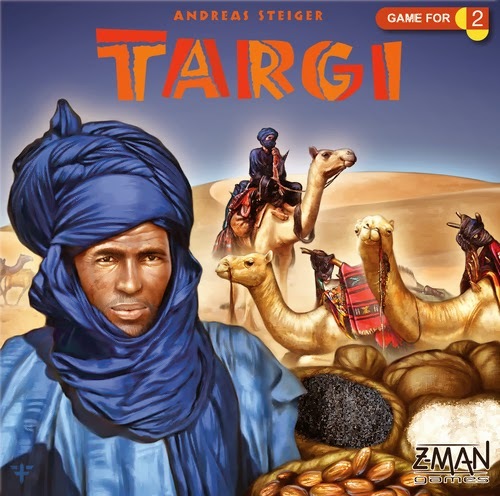 I have to admit that I was terribly hungover while playing my first game of Targi at Origins this past summer (there are some great gay bars in Columbus!) I suppose that coloured my initial opinion, despite having destroyed my opponent in the game. 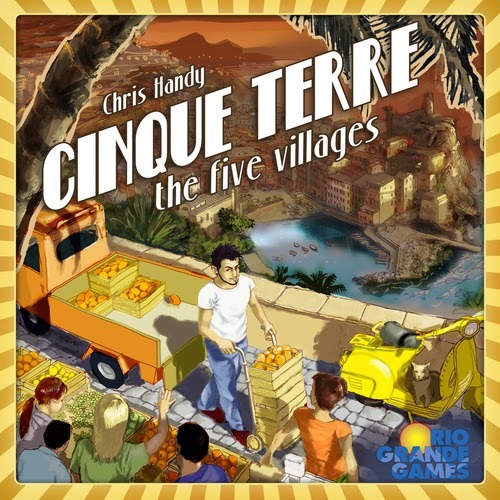 On further plays, in a much more conscious healthy state, I realized that this was a great, dense little 2-player game. It's kind of a worker-placement game but with a cool grid-like spatial element that keeps things very tense between the 2 opponents. 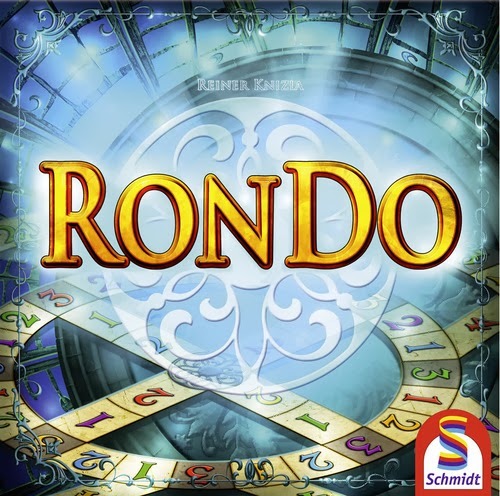 Fans of Kosmos 2-player games like Lost Cities and Balloon Cup will eat this one up. This was definitely the darling of many gamers this past year and it's easy to see why. For a game consisting of only 16 cards, this little 5-minute filler of bluff and deduction packs a bit of a punch. Sure it's got a ton of luck but the end of every round always begs for just one more play. And at 6 bucks, this game is a steal especially for the lunchtime gaming crowd. You can check out my review here. My final choice is an extremely clever cooperative card game, in which players hold their hands away from themselves and need to be given clues from the other players as to what they have. It is a very much an exercise in group-think and communication, but considering it's nearly impossible to actually lose it's amazing how tense this game gets. It's unlike any other cooperative games you may have played as it it doesn't suffer from 'follow the leader' syndrome. A lot of fun with a lot of different groups and a must in every collection. I have played Russian Railroads once and it is fantastic but it was this year so I'll count it on my 2014 list, I'm sure. Coal Baron is sitting at home waiting to be cracked - another K&K which I know I'll love. Thanks for highlighting Relic Runners. Overlooked this one and now I'm very interested. Yeah, I think it's just a fantastic game. Definitely not heavy-duty strategy but easily one of the best DoW titles out there, ranking up there with Small World and TTR.